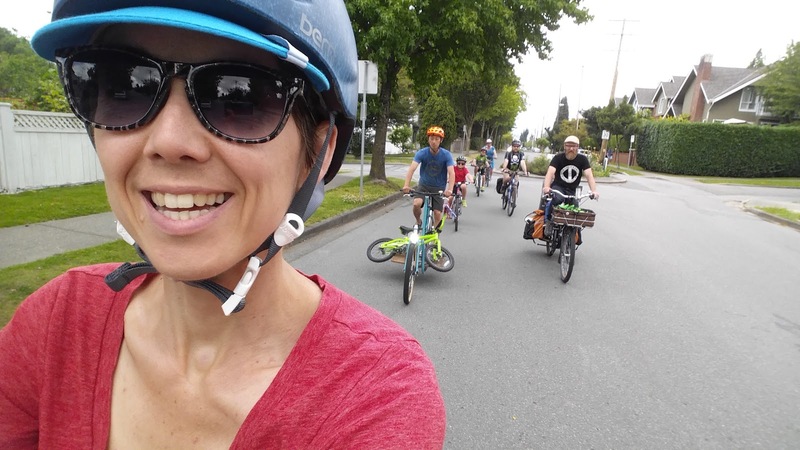 Sunday's Vancouver Family Biking Ride was tons of fun! 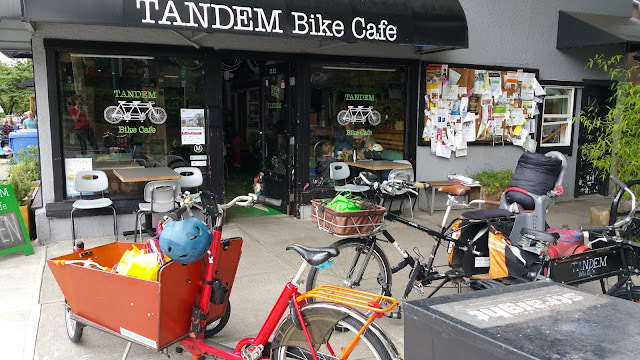 It was probably our longest ride yet, almost 15km from our meeting spot at Tandem Bike Cafe to Terra Nova Adventure Play Environment. 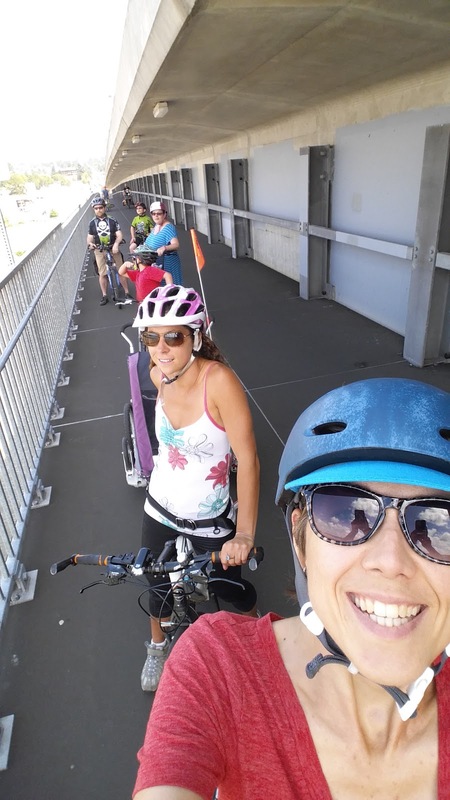 Five families joined the ride, a total of 13 people. Four of the six kids were riding their own bikes. Linnaeus was the youngest of them, & he had trouble getting up some of the hills, so he rode on the Yuba part of the way, while Clint carried his bike on his Metrofiets 'flatbed' deck. Having a few cargo bikes around means we can always be flexible & give rides to the youngest kids when they get tired. 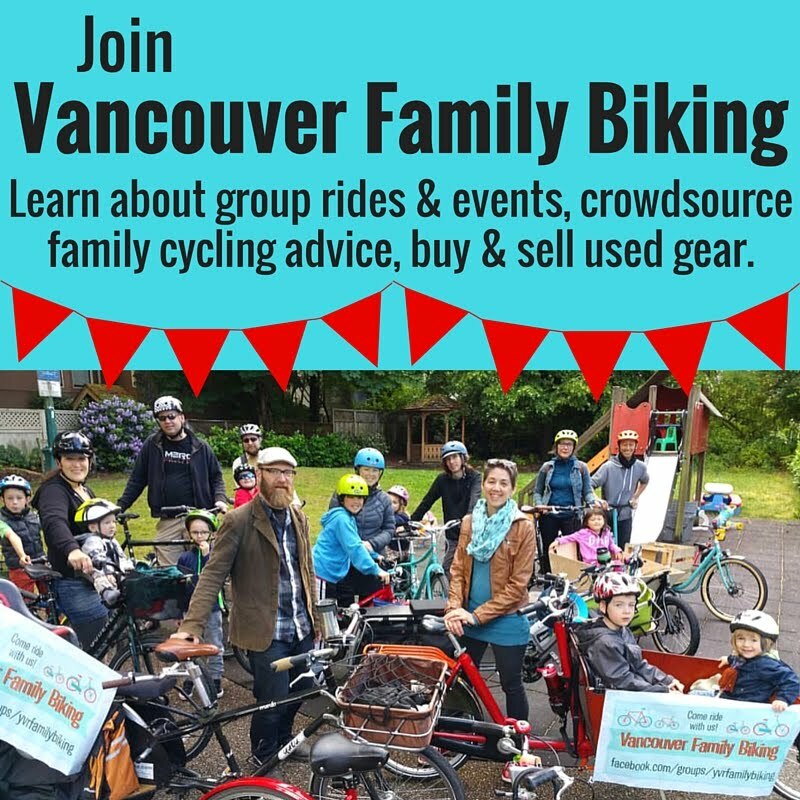 If you want to come on our next ride with a young rider let us know--we'll likely have several cargo bikes on the ride who can carry an extra kid &/or tow or carry their bike as needed. It's a great way to get little kids riding longer distances & give them more confidence without having to commit to them riding all the way or having a meltdown before they get home. 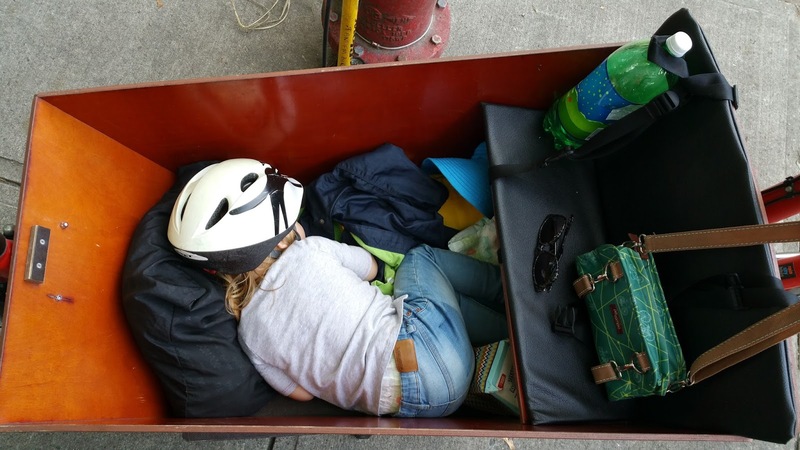 Read more on cargo bikes & supporting kids learning to ride here. We rode down Heather & over the bridge at a leisurely pace, with quite a few stops to load & unload Linnaeus & his bike from the cargo bikes, as well as meeting two of the families along our route, plus a bathroom/water/play stop along the West Dyke Trail in Richmond. The total time was about two hours, probably two thirds of that time we were riding, I think. Our route followed the Heather Street bike route south to Kent & then we went over the Canada Line Bridge. On the Richmond side we took the Canada Line Bikeway, then Smith Street, Beckwith Road, No. 3 Road, Capstan Way, then River Road for a block until the beginning of the dyke trail. Heather Street was quite quiet, more bike traffic than cars. The on-road part of our Richmond leg was busier, particularly along No. 3 Road, but the drivers were patient enough & there is safety in numbers. If you are a less confident rider on your own, or riding with a child on their own bike, you may want to take the sidewalk for some parts. Once we got up to the dyke trail, it was smooth sailing for everyone. The weather was perfect on the way to the park--sunny & not too hot. There was plenty of shade there & the parents got to sit & relax a little at a picnic table while the kids ran around in the playground. 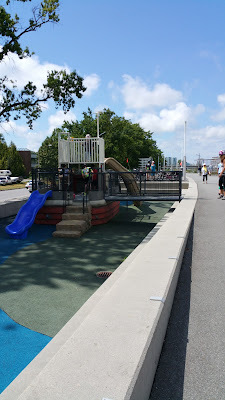 Terra Nova is a really amazing playground for kids of all ages. Now that Bronte has gotten a little bit bigger & stronger, she has figured out how to climb all the way up the giant rope ladder tangle that leads up to the 10 metre high tunnel slide. The ride home was quite warm--I regretted wearing jeans as they stuck to my legs--but still enjoyable with the breeze off the water & the sunny weather. The West Dyke Trail is well served by washrooms & water stations at multiple locations, so we were able to refill all our water bottles as needed. I really enjoyed the ride & the kids love Terra Nova, so I am certain we'll do this ride again sometime soon.